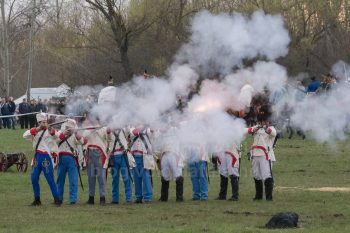 People in period military uniforms re-enact a historic battle in Tapiobicske (about 60 kilometres East-Southeast of capital city Budapest), Hungary on April 4, 2018. 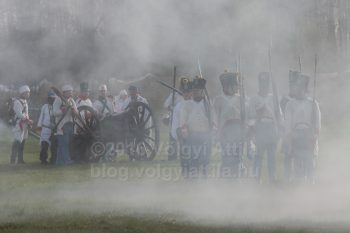 169 years after the real Battle of Tapiobicske history enthusiasts reenacted the famous event with great joy. Hundreds of school children witnessed the unique history lesson and they enjoyed it almost as much as the people participating dressed as Austrian or Hungarian soldiers. 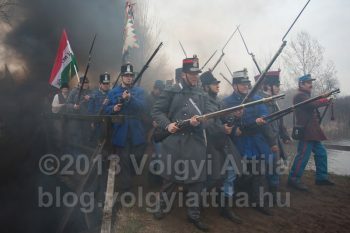 History enthusiasts reenacted again the Battle of Tapiobicske and Hungarian forces won the fierce battle once again. Just like I wrote about it a few years ago, this battle reenactment is full of interesting scenes this year again. On 4th April in 1949. after long drawn fights the Hungarian trops managed to get through river Tápió and defeat the soldiers of the Habsburg house then take back the village of the Hungarian populated Tápióbicske.